I love working with color, particularly with period homes. 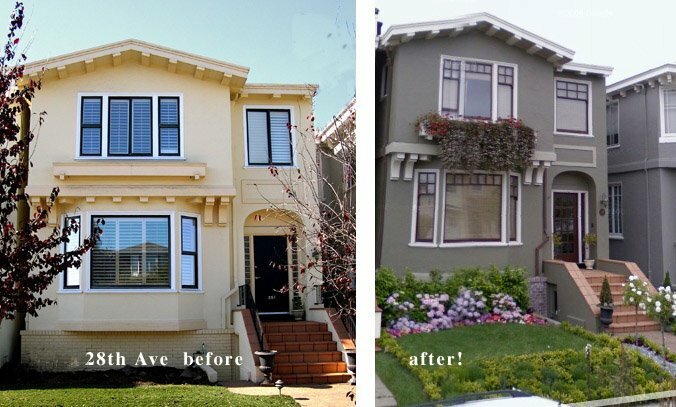 Here are a couple of recent transformations which illustrate my motto: do what will make the architecture look its best! Often this involves a bit more than paint colors to get the desired result. The previous owner of this home in Sea Cliff had "simplified" this house and painted it yellow in an attempt to make it look "Tuscan." 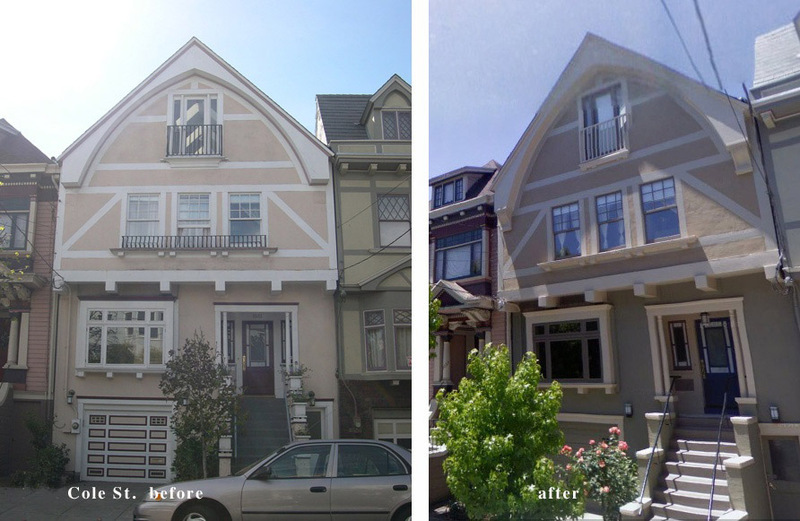 My clients wanted to see the house restored to its original style, and look more like a formal City house. Black aluminum windows were replaced with insulated windows using the original Edwardian profile. San Francisco Local Color Painting stripped the paint off the foundation walls revealing the original red bricks, and then painted the entire house using all C2 paints. The color scheme is a nod to the arts and crafts era. I started with a de-saturated green/grey accented with oxblood-red windows, and a linen-color trim that appears white in contrast to the body color. A fourth color; a warm, lighter green; is added under the eaves and on the stucco cross pieces to show off the more horizontal features and give these details a lift in the areas where it might otherwise get heavy. The result is a calm, period-style facade with elegant detail. My clients on Cole Street disliked the whimsical "storybook" look of the house and wished to downplay the decorative half-timbered beams. They wanted the house to be simple and modern. However, previous attempts at "modernizing" this facade- by removing some features and adding others- only served to make it look more convoluted, and the old pink and purple paint job made a really big deal out of the garage door. I convinced the homeowners to restore the facade as much as possible, to give it back its architectural stability, which would go a long way towards creating a more refined entrance to their home. Iron railings were removed, missing brackets replaced, the garage door replaced with something plain and simple. The color design involves six colors of paint, some of which were custom mixed. The body above the main horizontal beam is painted a warm, tan color, with just a bit of contrast between the stucco and wood. A jazzy cobalt blue front door integrates the blue stained glass surrounding it, and calls attention to the entrance. The base and garage door are painted solid with Benjamin Moore "Hampshire Grey." This deeper color gives the massive facade a grounded base, and makes for a more stately appearance from the sidewalk. Now the overall look of this house is grand, true to its period style, without being cute or nostalgic.